I walked the sidewalk in the predawn hours with a box filled high with gifts. I was a little nervous since I had just found out that felons can’t carry pepper spray so I had to leave the one I was given at home. Fortunately, most of the people I passed by now know me by name and also seem to know that if they mess with me, I know them by name too. It was freezing cold and I don’t own a jacket. Both of these reasons impelled me to walk faster. It was going to be my last day doing community service work on Skid Row. Too bad I still don’t have a probation officer to impress with how quickly I did it. Only forty more hours and those are assigned with CalTrans. I was able to donate a clock to replace the teenie one they have hung up in the bed area. If I had a dollar for every time a client stared it at, squinting, and asked, “Hey, Ms. Lady… what time is it?” I’d be a rich felon. I was also able to donate a bag of black pens. I’m sure they’ll last a day or two. And a couple of big bottles of hand sanitizer which is always running low. My children baked cookies for the staff the night before. They are really good at it. Who knew? But my favorite thing to give away was all the little gifts I had collected over the past weeks for the individual staff members. I had been anxiously awaiting today, my last day, to spend the whole day just loving the people who give and give and give in a part of the city that nobody ever sees. I’ve been aching to give back to them, to let them know how amazing they truly are, even when they rarely hear it. I gave Wendy a little necklace with a silver starfish and the story of the starfish. If you don’t know the story, it’s here. I was super blessed to pass along someone’s study Bible for Jim so he can prepare for his sermon in April. I brought Linda a book of encouragements to read in the morning before she greets the endless line of people bringing her bags to be checked in at the front counter. Pilar got an angel pendant to remind her of the thankfulness I’ve had for her protection and kindness during the night shifts I did. Everyone got a little something that I hope and pray will remind them, if only for a moment, of the difference they make in the world. I want them to know there is gratitude for what they do that is deep and abiding. Most of all, I brought something inspiring for Eric. It really wasn’t much, but I’ve been thinking about it for a while. I gave him one of those window candles homes sometimes have back east or during Christmastime here. I was once told that the tradition began during the civil war when families would keep a candle lit at night if they had a son or father or husband away in battle. It represented the warmth of the home they were going to someday come home to, the hope of their return. I thanked Eric for the light he holds in the darkness for soldiers who have lost their way. His outpost is far off in the trenches, alone in the dark. But the light of hope he holds is very real for those who are ready to end their travels. The flowers I received from staff at the shelter... The most beautiful I have ever been given. 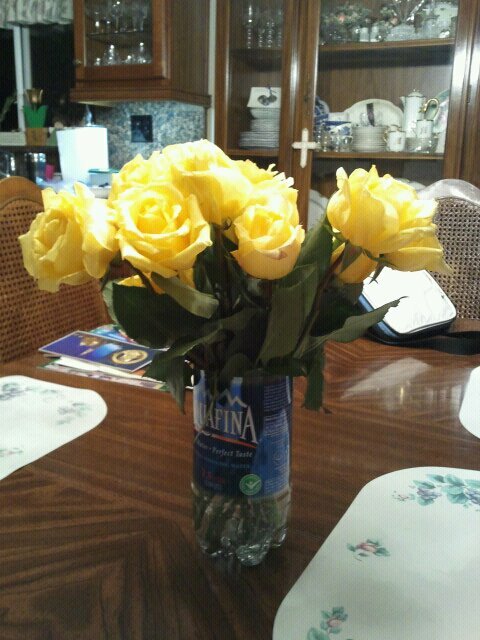 A few of the staff members pitched in together and bought me a dozen yellow roses which I promptly placed in the only vase we had… a water bottle with the top cut off. It brought me to tears and is the most beautiful bouquet I have ever received. I stayed an extra half an hour until the shift’s quitting time. Jimmy, a staff member from the next shift gave Wendy and I a ride to our cars. As we drove, he pointed out a white hipster with a camera, taking video of the humanity occupying San Julian. He panned down the street, shooting the sidewalk tents and inhabitants. “Why they gots ta do that?” Jimmy asked. Even though he is staff, this is Jimmy’s home. He can’t even begin to understand why people on the outside would be documenting Skid Row. There is so much work to be done here. Not to “clean up” Skid Row or its’ people. What needs to be done is to lift the sights of its’ residents. I will not believe progress has been made here until Jimmy is laughing at the guy with the camera and calling him a tourist. When I gave my last hug and got to my car, I thought I knew a thing or two about Skid Row. But in one hour I was headed back to visit a different building, a block north of where I had done my community service. Some of the members of a church I’ve visited recently in Los Angeles were handing out new shoes, clothing, food and Thanksgiving groceries to families. I was about to find a drastically different dynamic only a stone’s throw away.